Here’s another instalment of our meet the team and best job in the World blog, with the one, the only, the legendary King Julian. 5. What do you love about surfing? What I love about surfing is that I get to focus on nothing but catching a few waves. It sounds selfish but its my time. Its kind of cliché but I can forget about everything else on dry land for a few hours and when I come out of the water I feel more refreshed and kind of ready to face whatever life throws at me. Its like a cleansing process. From a professional perspective I love training up the new guys and gals that come through the ranks. Helping them to feel more confident and giving them the tools to become really good surf coaches is really rewarding. Its all about sharing the stoke!!!!!! 6. What do you love about your job? Wow it was such a long time ago its hard to remember! But I guess its doing something that I love doing. I love to natter to people and I love to surf put the two together and you are well on your way to being a great coach. 7. How did you get into it? I remember watching a guy taking a surf lesson and I thought that would be a pretty cool job so after getting a few years of surfing I got my Lifeguard certification and my BSA (Back in the day) quals then landed a job with a mobile surf school which then turned into a permanent site worked my way up the ranks and ive never looked back since. 8. What do you love about your job? Wow, where do I start? There are loads of things I love about my job but the one that really stands out is when a surfer finally nails something that you’ve helped them to do whether that’s stand up, turn or take that drop on a 4 foot bomb. The look on their face is priceless and being part of that experience is something pretty special indeed. 9. Are there any negatives? A few, I guess as a surf coach/ manager your busiest time is during the summer holidays so you can sometimes miss out on doing stuff with family and friends as your working pretty much full power. Opposite of that is the standard like putting on a wet and cold wetsuit in November is never nice. Despite all of this the positives well out weigh the negatives and I wouldn’t change it for the world. 10. What’s the hardest thing you’ve had to deal with so far? I feel as though surfing should be accessible to as many people as possible. In the past I have run lessons for people with physical and mental disabilities, which has always been a challenge but also very rewarding. Throwing yourself into the unknown can sometimes be a frightening proposition but its amazing how much you can learn about yourself if your willing to face new challenges. 12. Do you have any basic tips for the average surfer? And again mate. 13. What are the three best things about Newquay / Perranporth? My fave things about Newquay is the mellow waves, awesome beach and the crew that we have working for TTR and who are also really good friends. 14. What does a surf lesson with you entail? Describe the Julian experience: The King Julian surf experience is second to none. In a two-hour lesson with me I can guarantee that you will have heaps of fun whilst learning. Having been surf coaching for over 13 years I know pretty much every trick in the book and will try my very best to get you up and riding the waves. If you’re willing to let your hair down throw yourself in to it and up for a laugh then grab your board and lets go!! 15. Newquay or Perranporth? Man, that’s a tough call, ive had so many good times at both. But if I had to choose then it would have to be Newquay just because that’s where im living and working at the moment. 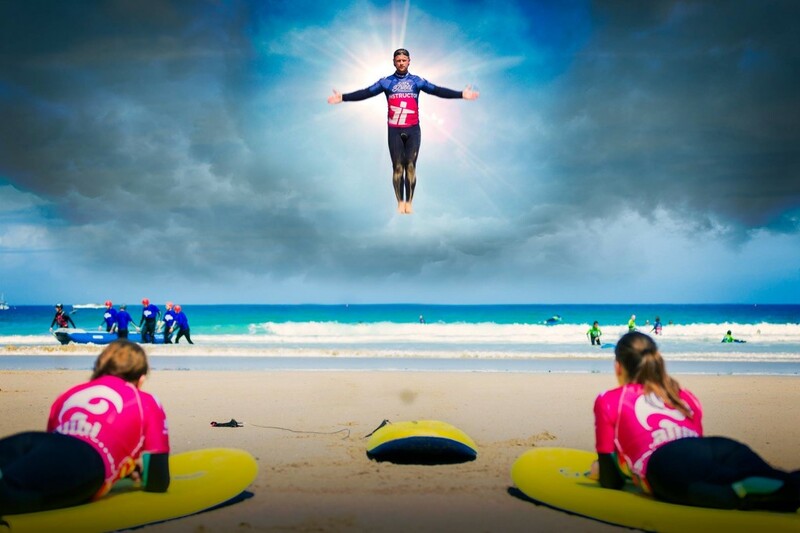 This entry was posted in Learn to surf, Surf School, Surfing newquay. Bookmark the permalink.